The National-Dobro/Regal connection story is fairly well known in vintage guitar circles, but it's worth repeating. 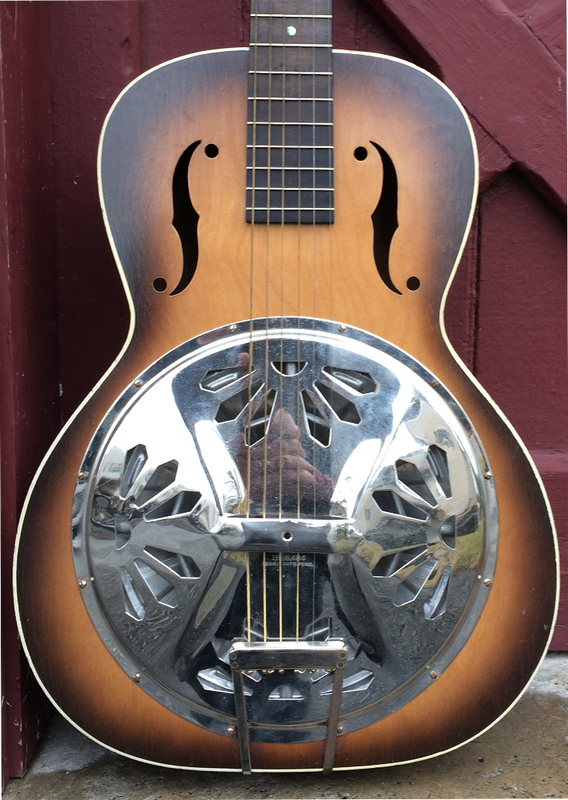 In the early 30s, the California-made National-Dobro resonator guitars were selling like hot cakes, so the Regal factory, in Chicago, was contracted to build the wood body, and install the metal parts shipped from California. In 1936, all California assembly had moved to Chicago. 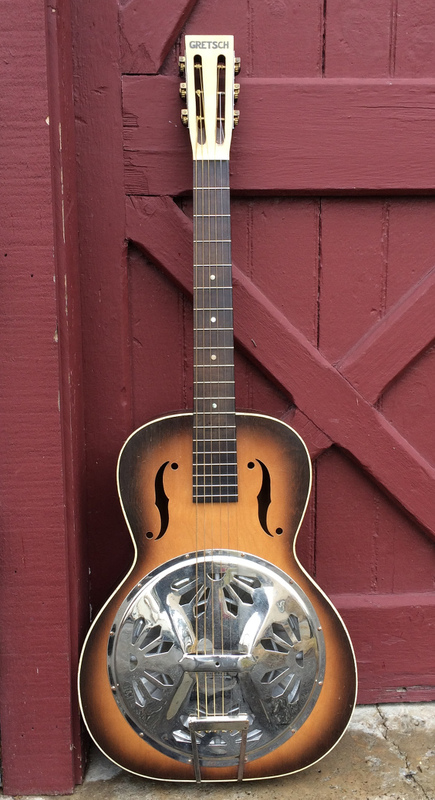 Additionally, it's well known that Regal built many resonator guitars without the Dobro or Regal name, or made for another retailer such as this example, which bears the Gretsch logo. These guitars were distributed through jobbers, and were ultimately sold through stores or catalogs, such as Sears and Montgomery Wards. 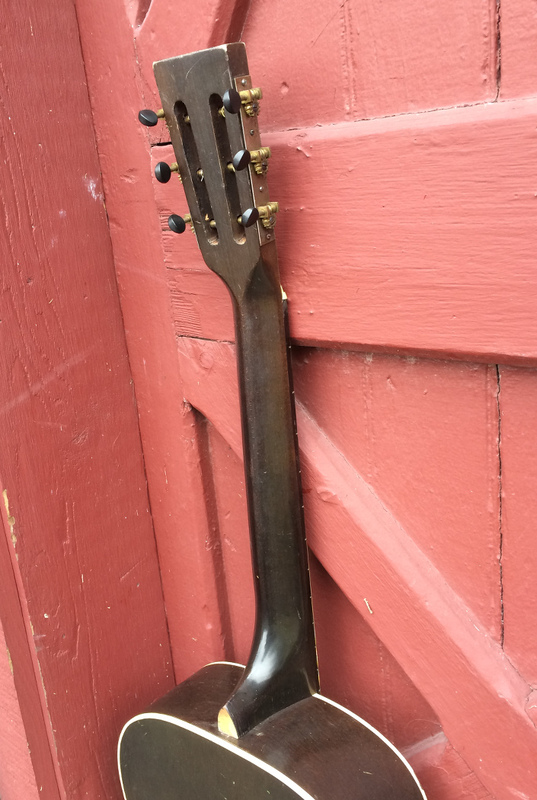 This guitar was made sometime before WWII shut down production of the metal parts due to the war effort. It's difficult to date, since the off-brand instruments rarely had serial numbers, but we'd guess c. 1938 would be fairly accurate. The body is ply, which was used in all wood-bodied Dobros and Nationals we've seen. The top has two 'f'-holes, and is bound in white paint both front and back. The top sports an attractive sunburst. Inside is the typical Dobro setup of eight-legged aluminum 'spider' and stamped cone but no soundwell as found on many Dobro-labeled instruments. Additionally, this construction method has no neck 'stick' but rather a traditional dove tail to attach the neck. The nickel plated cover plate is of the 'poinsettia' style and bears a stamped patent number. The tail piece is original. 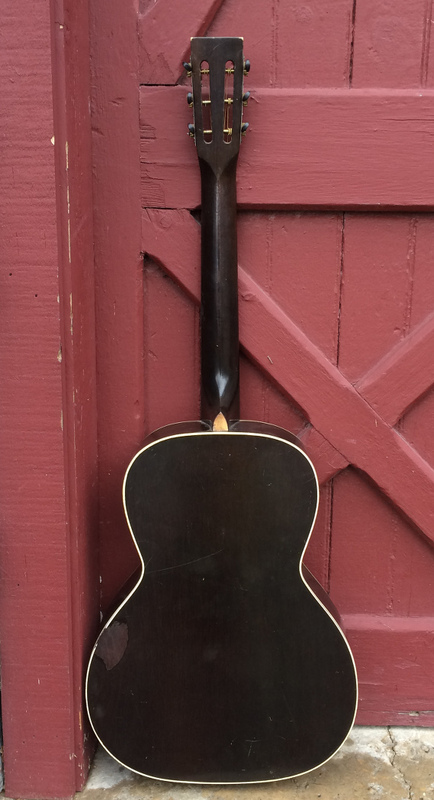 The neck is likely poplar, and is carved in a 'V' shape. The head stock is covered in MOTS celluloid with GRETSCH stenciled in black. (A celluloid heel cap may be missing at the tip of the heel. )The fingerboard is likely 'ebonized' wood, and sports four pearl position markers. The tuners are original. The guitar is in original, excellent condition. There is no evidence of prior repairs or alterations. A recent neck reset and fret leveling were all that was needed to get the guitar playing again. There is a small patch of missing finish on the back, and various nicks and dings are evident from use and wear. With the recent neck set and set up, the guitar plays easily, with action set at ~ 8/64". The sound has the Dobro plaintiff wail, but is not quite as piercing as the Dobros with the sound well, which makes this model excellent for country blues and ragtime picking.